This model has been built with the differential expressions in Revilla and Garcia-Ramos' 2003 paper for a dynamic model for HIV-1 therapy. This file is known to run in OpenCell to reproduce all panels in figure 2. The units have been checked and they are consistent. 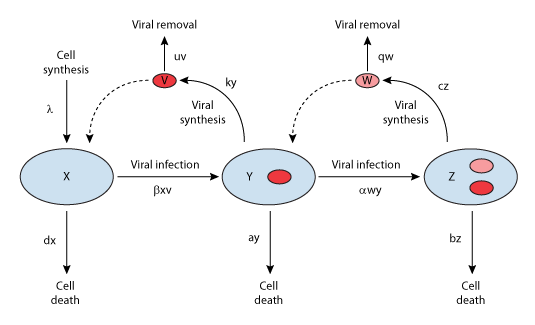 The initial conditions [x, y, z, v, w] can be altered to replicate the different panels [single infected system (a): x=200, y=0, z=0, v=10^-6, w=0], [system with double infection (b): x=3, y=6, z=0, v=149, w=1], [alternate system with double infection (c): same as b, but alpha=0.016], and current parameterization is set to replicate figure2b. Note that in the paper, the figure diagrams are scaled logarithmically. Note that the model also runs in COR, but due to the unit of time being days, the timescale is a problem for the CellML model simulation to recreate the published model results. ABSTRACT: A mathematical model examined a potential therapy for controlling viral infections using genetically modified viruses. The control of the infection is an indirect effect of the selective elimination by an engineered virus of infected cells that are the source of the pathogens. Therefore, this engineered virus could greatly compensate for a dysfunctional immune system compromised by AIDS. In vitro studies using engineered viruses have been shown to decrease the HIV-1 load about 1000-fold. However, the efficacy of this potential treatment for reducing the viral load in AIDS patients is unknown. The present model studied the interactions among the HIV-1 virus, its main host cell (activated CD4+ T cells), and a therapeutic engineered virus in an in vivo context; and it examined the conditions for controlling the pathogen. This model predicted a significant drop in the HIV-1 load, but the treatment does not eradicate HIV. A basic estimation using a currently engineered virus indicated an HIV-1 load reduction of 92% and a recovery of host cells to 17% of their normal level. Greater success (98% HIV reduction, 44% host cells recovery) is expected as more competent engineered viruses are designed. These results suggest that therapy using viruses could be an alternative to extend the survival of AIDS patients. Derived from workspace Revilla, Garcia-Ramos, 2003 at changeset fdf8ed9269a0. Revilla and Garcia-Ramos's 2003 dynamic model for HIV-1 therapy.